You know what they say, in order to do your best you have to feel your best. When you’re trying to achieve your fitness goals, you need to be able tos perform at a high level day in and day out. But it’s no secret that when you’re feeling subpar physically or mentally, your performance suffers. Getting enough Vitamin D everyday will help you achieve optimal physical and mental wellness, so that you can conquer your fitness goals. Vitamin D can be obtained in small amounts from the foods you eat, and it can also be synthesized in your body when you’re out in the sun. But it can be hard to get enough to meet your daily needs just from diet and sunshine alone, especially if you are tracking your macros or restricting your calories. Being deficient in Vitamin D can lead to fatigue, a weak immune system, bone pain, and even depression! That’s where a Vitamin D supplement comes into play! Vitamin D supplements can help you reach your daily needs, filling in the nutritional gap and preventing Vitamin D deficiency. But not all Vitamin D supplements are the same. Some are better than others. Some Vitamin D supplements provide Vitamin D2 in the form of ergocalciferol. While it was long thought that Vitamin D2 and D3 were interchangeable, recent research shows that Vitamin D3 is more potent and longer lasting. Other supplements provide Vitamin D in lower amounts than you need to help you meet your daily requirements. Vitamin D provides the benefits of stronger bones, enhanced mood and a stronger immune system! Your bones provide the structural support system for your body. Every move you make puts stress on your bones, and if they aren’t strong, you could constantly be dealing with pain, discomfort, and feeling weak. A vitamin D supplement supports bone density and strength, so you can train hard in every single workout. And while you’re training hard, you can’t afford to be slowed down along the way with getting sick and not feeling good. A Vitamin D supplement can help bolster your immune system so that you can keep up with your active lifestyle. Vitamin D also plays a role in supporting a good mood! And we all can benefit from being in a good mood, right? On the road to burning fat, building lean muscle, gaining strength and endurance, and maintaining a lean, powerful body, it’s essential to feel your best every day. The better you feel the harder you’ll be able to work and the better results you’ll see. The right Vitamin D supplement provides Vitamin D3, in the form of cholecalciferol, in the right amount to meet your daily needs. It should also be free of artificial colors, flavors, and preservatives. The right Vitamin D supplement can help you feel your best. Often, obtaining too much sun exposure is considered bad because it can lead to skin cancer and premature aging of the skin. So many people look to sunscreen and protective clothing to protect themselves from the harmful rays of the sun. But when you do this you are also limiting the amount of Vitamin D your body can absorb, which can make you deficient in this essential micronutrient that is critical for human survival. Vitamin D3 is the body’s preferred form of Vitamin D, and will help to raise levels of Vitamin D in the body. 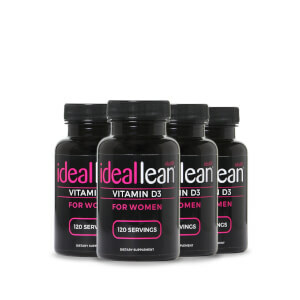 Supplementing with IdealLean Vitamin D3 will promote stronger bones and a stronger immune system so that no matter where you are in your fitness journey and life, you can work towards your ideal body and better health. 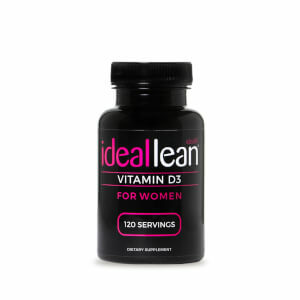 Can I view the nutritional facts for IdealLean Vitamin D3? Known as the sunshine vitamin, vitamin D3 is produced by the body in response to skin being exposed to sunlight. It is also occurs naturally in a few foods -- including some fish, fish liver oils, and egg yolks -- and in fortified dairy and grain products. Can I take this while I am Pregnant? As with any dietary supplement we recommend speaking to your doctor before starting. How do you get Vitamin D deficiency? You are obese. Vitamin D is extracted from the blood by fat cells, altering its release into the circulation. It is currently in testing. Vitamin D3 should be taken only once a day with a meal, unless directed otherwise by your doctor. How much Vitamin d in regular foods? How much time in the sun ( time = iu )? Your body can produce 10,000 to 25,000 IU of vitamin D in just a little under the time it takes for your skin to turn pink. You make the most vitamin D when you expose a large area of your skin, such as your back, rather than a small area such as your face or arms. Can I get Vitamin D3 from the tanning bed? No, tanning beds are 95% UVA rays rather than UVB. UVA conversion to vitamin D is very minimal.